The living room is the beating heart of the family home, and with big, bustling families of their own, the Amish woodworkers who craft our Mulholland corner stands have a deep understanding of the value of a well-organized family room. That's why this TV stand - built by hand to your style - is designed specifically to conserve space and storage while simultaneously bringing the timeless look of the classic American country home to your family living area. 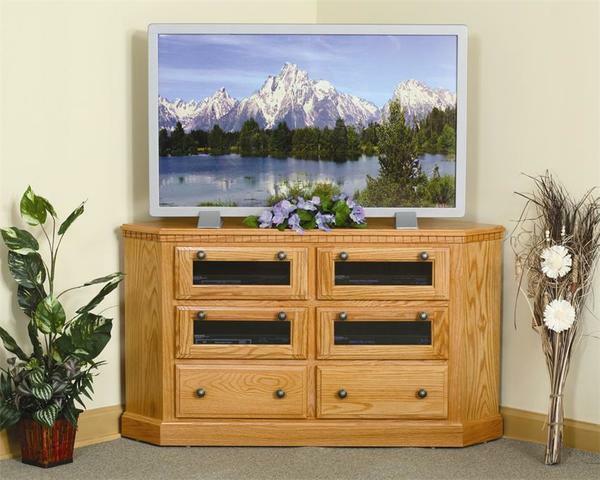 In addition to looking beautiful, this solid wood marvel also offers an impressive storage. The spacious bottom drawers provide the ideal home for a growing library of games, DVDs, and more, while the four smoked glass doors house shelves that offer a safe, clean home for valuable media players and consoles without blocking remote control signals. The stand's wide base and effortlessly convenient, living-room-friendly style ensure that its ample storage space will always have a place in the home. Every piece of this beautiful piece is built by hand right here in the USA, bringing you the best in home-grown workmanship. Use the menus above to choose your ideal wood and stain, and if you run into any questions at all - big, small, somewhere in between - please don't hesitate to get in touch with us by phone or by email.